Sometimes you get an idea that shouldn't work but it just about does because it addresses a problem. I've written occasionally about pocket squares - bits of material blokes use to dress up an otherwise workaday suit. Many men are wearing them at the moment. In fact there may be more blokes wearing them than you think. Mine have certainly developed a habit of sliding down into the pocket so that they can't be seen - leaving me self-consciously fiddling with them on the train, on the tube, on the street, when the whole idea was to make me look as if I didn't have a care in the world and had natural style. I look as though I've developed a new nervous tic when I'm wearing a particularly silky one. There are a few answers if you want to continue wearing the things. First, consider cotton - for white it's best, and it slips down a pocket far less easily than most. Second, get a big one - it will only slide into the pocket if there's space for it to slide into. I have a couple of decent-sized offerings from Ralph Lauren and from Duchamp which stay up simply because the pocket's stuffed with the rest; smaller ones vanish from view all too quickly. The trick with a larger one is not to show too much of it, so you don't end up looking flash. Or you can cheat like mad. A firm not too far from me, Hankyz, has started making ready-folded pocket squares, folded and stuck onto a card so you can fold the card to the right height and never get caught out.Yes it sounds like the equivalent of the ready-tied tie, and as someone who's only recently learned to do up his own dickie bow I'm quite down on those. But they do work - the hanky bit is of course genuine, it's just propped up. The key to the success of these is going to be the variety available and the price. At £28-£39.50 they're on the pricey side but hey, we wanted a proper bit of material rather than something dirt cheap trying to look like silk. The colours, patterns and general variety on offer are very promising. A nice addition to the dandy in your life's Christmas. 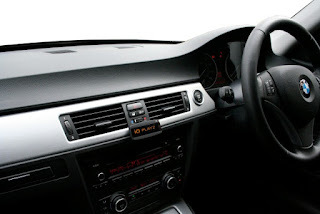 Some time ago the people at Armour Automotive put one of their iO PLAY products in my car. It's a Bluetooth kit that enables you to play music from your phone and receive calls whilst driving (please, please tell people you're driving and cut the call short, focusing on the road). You'd think when they offered to upgrade me to the iO PLAY 2 I'd have been delighted, but initially I wasn't. I didn't see how they'd improve on something this simple - pair a phone or two and it just works. Easy. Nonetheless I agreed - for the blog they'd offered to do it for nothing, saving £159.99 plus installation, so other than curiosity about what they'd change there was nothing to lose. I have to tell you it's marvellous. Many new cars now link their stereos with phones anyway, so there isn't much point in buying this, but if you have a relative whose motor doesn't do this it's worth considering getting one as a gift for them. First there's the built-in iPhone charger (for the iPhone 5 you'll need an adapter as the charger has changed). It doesn't stop there, though. There's a little display. This tells you which phone you're linked to. It has called ID. It has a voice - through the speakers it tells you who's texting and will read texts. It will, if you're linked through the charger rather than Bluetooth and using Siri on an iPhone, accept spoken commands. It lets you switch between tracks, albums (displaying the title), car audio, look up numbers in your phone book and initiate calls without taking your eyes off the road (although I'd still recommend pulling over if you're going to be thinking about a call rather than the road hazards). The original iO PLAY set my phone free - I'm not a massive headphone fan so driving with my music is where having a music phone comes into its own. This upgrade has allowed me to do more with it than just play music, and spares me the bother of fiddling with the handset finding music before starting the car, it remembers five devices so I can have my iPad as well as my phone ready to work without booting my wife's phone out of the memory. It is, quite honestly, pretty damned good and well worth the money. Unless your car already does this stuff I can't find a single down point. My thanks to the people at Niven and Joshua for responding to a query about men's Christmas presents. They recommended the Geo. F. Trumper range of shaving cream and sent a sample of the Coconut Oil variety. My father used a safety razor and always used soap to produce a lather with a shaving brush. That's a little while ago now, he died in 1984, but proprietary shaving creams were already starting to become big business. The thing about ordinary soap is that it will often dry up on your skin while you're shaving and you'll get what I call 'judder' - the blade fails to glide, sticks and bounces and ouch. If you're trying to use a safety razor this is bad news; if you're attempting to use a cutthroat as I've attempted (see this entry) then you're going to cut yourself, possibly quite badly. Many dedicated shaving creams are glycerin-based and will therefore stay fluid for longer. Essentially the cheaper they are, the faster they'll dry up. This coconut oil cream is distinctly pleasant to use. It doesn't dry up, although if you're using a cutthroat for the first time then I'd do an area of your face at a time as it takes ages while you're learning. The razor glides nicely and it has a very subtle scent while you're using it. My usual cream, Coates' Shaving Cream, is a 'limited edition' and therefore isn't being made any more. Once stocks run out I could see myself urging the guys at my barber to start stocking this as an alternative - I'm very likely to be using it again. P. S. Following the mention of my cutthroat razor I should mention that three days ago I managed to use it without cutting myself once - with a fresh blade, too, so it was definitely sharp. Now, if I can just get it to the stage where I look as though I've actually shaved, too, I'll have mastered it! Declaration for clarity: I have no affiliation or other link with either Niven and Joshua or Geo. F. Trumper - this is strictly independent commentary. I've been playing with a new phone. It's the new RAZRi from Motorola (sponsored link through my Amazon affiliate link) - you may have seen it advertised as the phone with the screen that goes all the way across the front. I'll be honest, I'm an Apple man myself (sounds like a rubbish superhero but never mind). I skipped the iPhone 4S and moved to the 5, and if I'm horribly honest it's been a bit, well, whelming. Yes it's a bit longer but apart from allowing me to put even more icons on than I had before, that doesn't really add a lot to the experience. I like Siri but that was in the 4S as well - new to me but not much of an upgrade. So when I was sent the Motorola to review I set about it with some enthusiasm. It is, I would confirm, the best looking phone from that company for quite some time. The screen really is pretty generous and if there's a disadvantage to not having an Apple retina display then it's not something my middle-aged eyes are going to worry about. In fact the larger screen makes it slightly easier to use than the Apple, although if I were going to be reading loads of emails then something like the Kindle Fire would be a better option (if I were in the market for an upgrade again I might have gone for a Samsung SIII - in fact after the iPhone I kind of wish I'd done so). It's a seriously nice looking phone and it works. It uses a micro sim, so if you have a phone with a standard sim you'll need to get another (you could risk one of those cutter things, but I'd be inclined to resist that). If your phone is one of those that uses nano sims (like the iPhone 5) then you can get adapters; be careful with these. I thought the easiest way to ensure mine didn't get lost was to stick it in the phone even when it was empty; without the sim in it the structure was weak, so when I pressed it to get it out, it broke. This, I hasten to add, was a third party adapter and not, repeat not, part of the package from Motorola. What is part of the package is the battery. I've never had a phone that lasts the best part of two days on a single charge - well, I have, but it was just a phone rather than an emailer/music player/Internet searcher/video machine...you get the idea. The battery life is one of the most striking things about this gadget. In terms of synchronising with a Google account it does everything you'd expect, very quickly, and a load of it worked right out of the box without the need to install extra apps. Some of the social apps, Twitter, Facebook, LinkedIn and others, are free and it might have been nice if they'd been preinstalled. But this is the most promising phone I've seen from Motorola certainly this decade, possibly for a lot longer. Clearly if I want to use it longer term then I'll lose all my iPhone apps - there's no reason anyone should hand me an Android version for nothing - so that's a consideration. Also not all of the movies and TV shows I've downloaded from the Apple App store are compatible (see how they lock you in?). They'll work with the iPad so that's not a huge problem for me; others may differ. But if you were thinking of buying your first smartphone and hadn't already been thoroughly tied to one particular software environment, this would be an excellent, clear, powerful phone to own. I've been thinking about Christmas shopping just lately, particularly in the men's lifestyle range as you can imagine. Rather than go online, at least initially, I've been looking into where to go in London if you want to visit somewhere physically. The St. James' area is a must. Crockett and Jones for footwear, Geo. 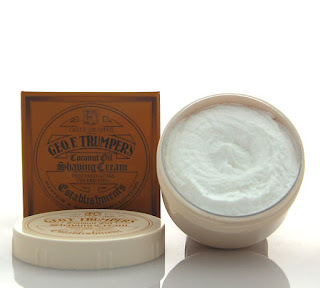 F Trumper for shaving accessories - don't expect to come out with much change from, well, anything. Foster and Son will make bespoke shoes for only £2850 (it's a distinct skill and not for the fainthearted), although they won't be ready for a few months - but you can give vouchers towards them for anyone who might be interested in saving up. Check also Alfred Dunhill, which alongside the usual highly prized (and priced) ties and clothing is now starting up in gadgets - its projected keyboard is nifty, although I wouldn't want to be bashing my fingers on a table for long. More locally we've had a branch of men's designer Simon Carter open up in Crystal Palace. Nice place, some nice ties and accessories, I'll no doubt be back shortly. Always good to see a new business opening up locally - I can only hope there will be enough interest to sustain it. I suspect my going in and not buying so much as a pair of socks this morning will have done little to help. So, where are your favourite local shopping cubbyholes? Last week I promised I'd share my experience attempting to use an open or "cutthroat" razor. If I start by saying it will probably be my last, you'll get the idea. The Bluebeards sent a perfectly respectable shavette - basically a straight razor lookalike which takes disposable blades. Nice piece of kit, £9.99, click on their name to get hold of one. Once I'd loaded it up - snap a standard blade in half and put it where it fits, basically - I washed, lathered up and started shaving. My barber does it, it can't be that difficult, can it? Er...yes. Yes it can. The Bluebeards' site says get an angle of around 30 degrees and apply next to no pressure, going first in the direction your hair is growing and second in the opposite direction. I have no doubt this is a perfect description of how it's supposed to work. So no, I can't tell you exactly why it didn't do much for me. I mean, the blood was probably because I'd got the pressure wrong - and the bit where my hand twitched, you just don't want to know. The angle is probably something else I got wrong - and would no doubt account for the fact that by the end of the attempt - sorry, half way through when I gave up - I had two small grazes under my nose, a mild abrasion on my cheek and a couple of nicks on my chin. Oh, and an actual cut of about half an inch on my jaw, looking as though I hadn't shaved. And a wife who was more than usually concerned for my sanity. And a daughter who thought the whole thing was the funniest thing she'd ever seen. Today I had a go with my trusty Merkur Futur. If I'm honest, I'm quite clean shaven, no cuts anywhere (healed up nicely over the weekend) - and before I take up the shavette again I'm going to have to work out exactly what I'm trying to fix here. Shaving with a cutthroat razor is a skill - if you want to take it up, good luck. But never underestimate the damage a naked blade can do. ...and once again the bald patch in my moustache dictates I won't be taking part. Instead I'll be making a few choice donations - so if you're growing a Mo, leave a Justgiving link as a comment and I'll have a think about sending some dosh - and I hope other readers will do the same.